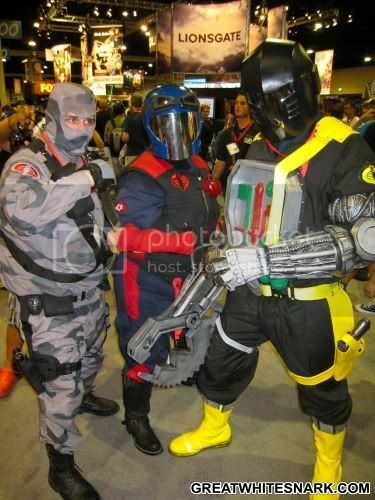 You wanted to spend your day awash in Comic-Con costumes, right? Yes, I thought so. I accept demonstrations of gratitude in the form of exotic Maori tribal dances and American dollars. 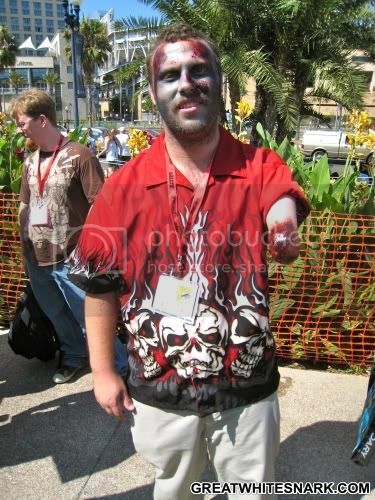 Unless you have ever lost a limb and then have gone to Comic-Con as a zombie, having painted your missing limb like a bloody stump, you have never been as committed to a costume as this guy is. Never. 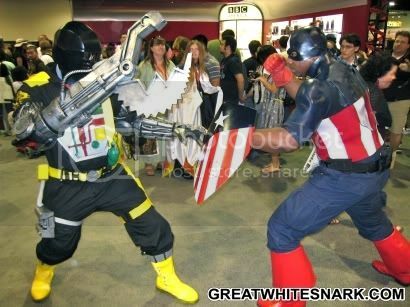 Sometimes a Cobra Trooper will fight Black Captain America. This is a thing that happens. 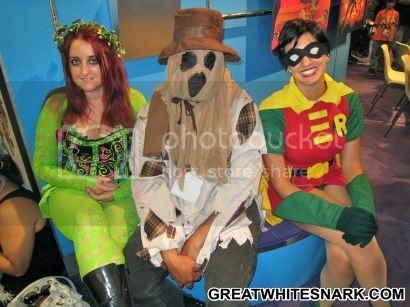 At Comic-Con. Lady in a Trinity costume taking her character very seriously. 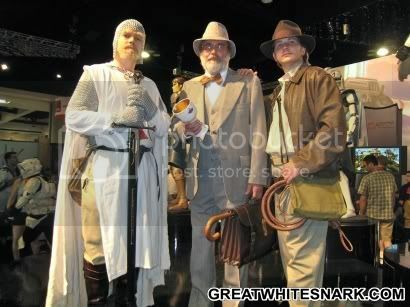 The boys from Indiana Jones and the Last Crusade. LucasFilm will let anyone in their booth. 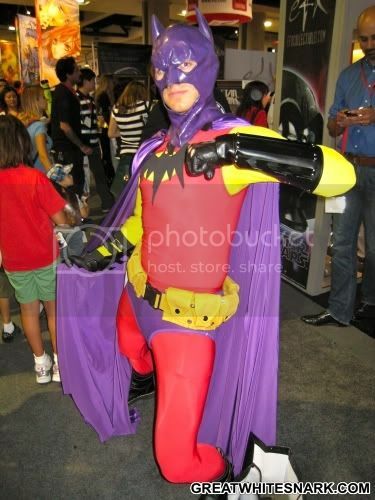 Batman costume from the recent R.I.P. storyline. I’m sure those of you not in-the-know are wondering why Batman joined a circus from the 1960s. 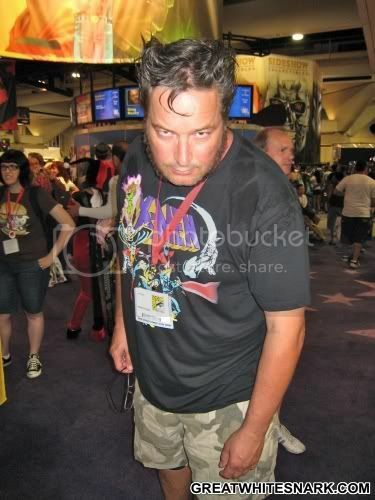 It’s funny how quickly an ill-timed blink can diminish one’s badassery, eh, guys? 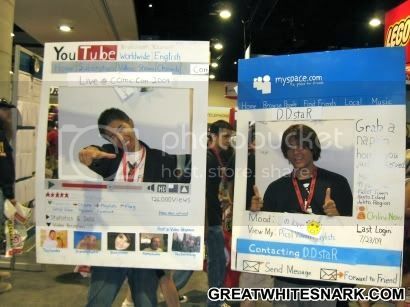 Ten points for creativity, seven for execution. Like I said before, lots of Catwoman costumes. And it is my personal struggle to document them in all of their form-fitting, skin-exposing glory. 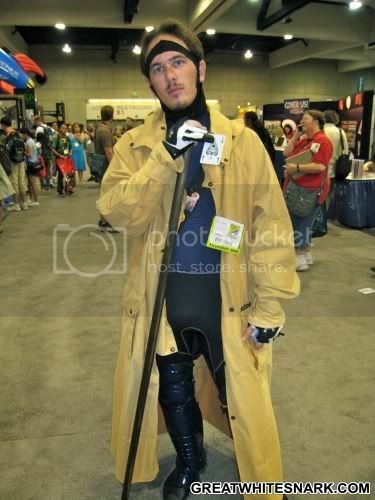 I’m calling it early: laziest costume at Comic-Con. If you hadn’t guessed based solely on the hair and chops, this is Wolverine. Booth babes create oxygen through photosynthesis and nourish all of us! It’s a fact. They are also all guaranteed to be wearing a costume for something you won’t recognize. Take this woman, for instance. Those are the breasts of someone hired to promote something. And who the hell knows what that thing is. Yay, I’m the Phoenix! Yaaaaaay! I literally cajoled this girl into striking a pose, and this is what she came up with. I take what I can get. 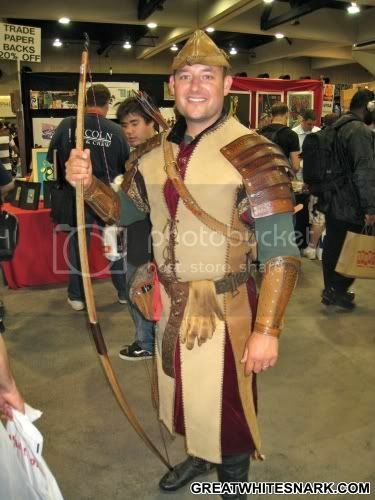 Home-made Robin Hood costume. There are apparently riveted leather pieces on there or something like that. These are Venture Bros characters, right? 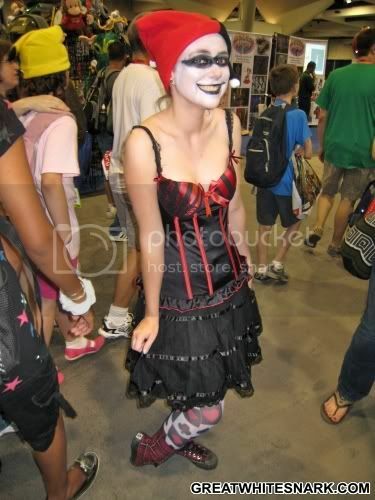 Death Note costumes. Ok, I’ve been reminded that the monster is Ryuk the Shinigami, but I forget the name of the sulky boy genius kid. 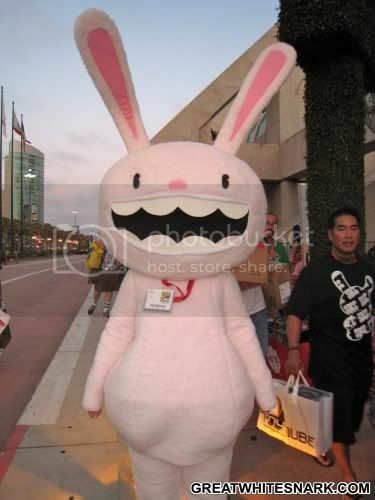 Max from Sam & Max. Whom I didn’t recognize at first because he was pink. And six feet tall. Phoenix’s arms are freakishly long!! 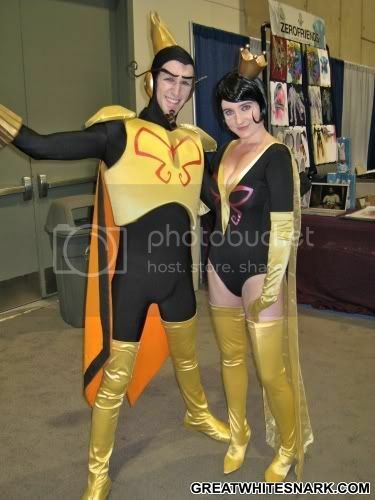 The Venture Bros characters are Monarch & Dr. Girlfriend. Great pics! GWS, it’s mother yoishi from dragonball. 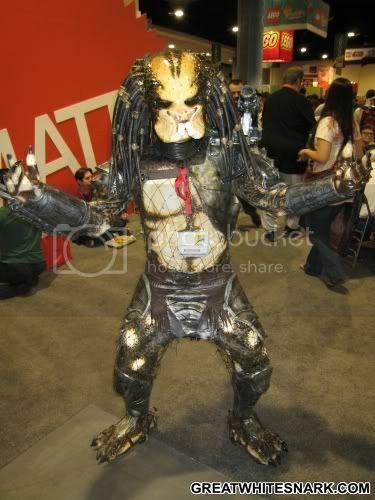 And the cobra dood with the giant claw is the Android Trooper (don’t think he had a real name…). Great coverage! It really makes me wish I wasn’t poor and living 2,000 miles from the event. 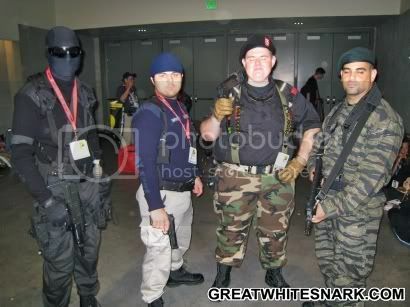 The 3 cobra costumes are as follows (clockwise starting from the left) Firefly, Cobra Viper, Cobra B.A.T. (Bat Android Trooper). awesome! thanks for the coverage! 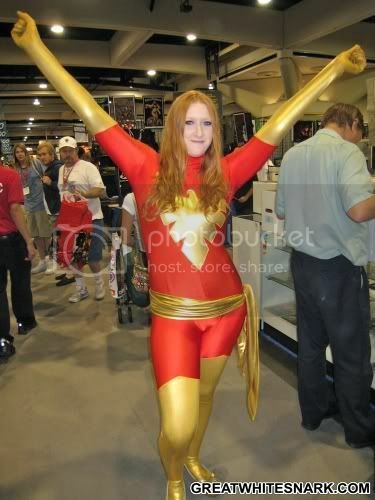 The Phoenix chick should have gone as Elasti-Girl with those ‘Incredibly’ long arms! Black Captain America is named Josiah.